Hidden within a housing estate alongside central London's inner ring road was once a secluded forest of 450 mature trees. Some of them pre-dated the 1973 Heygate Estate, other trees were the legacy of the generous vision of Tim Tinker, the estate's architect, when landscaping the public space between his perimeter blocks and central maisonettes. In 2011 it became apparent to several locals that this precious natural area was vulnerable to the comprehensive redevelopment of the estate by Southwark Council. The year before they had agreed to sell the land to developer Lend Lease. The loss of green public space was one threat of many regressive proposals facing residents and the wider neighbourhood. 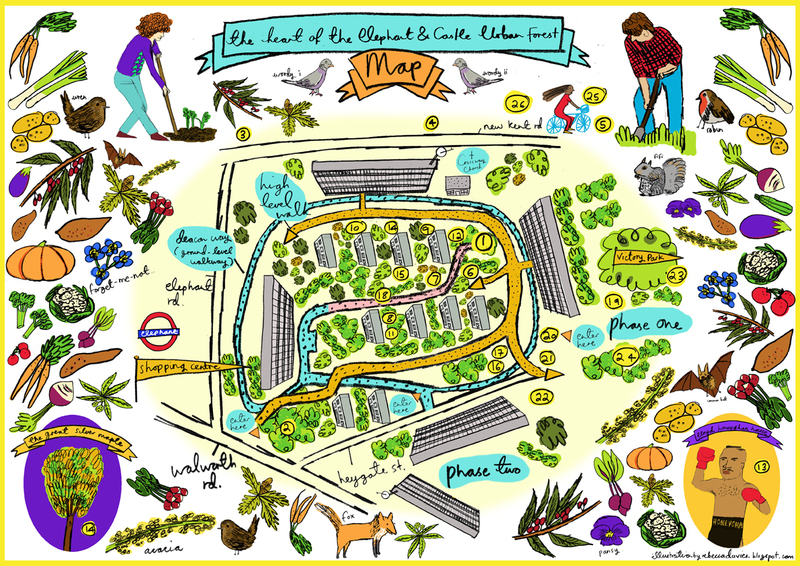 Elephant and Castle Urban Forest was one of the campaigns launched to raise awareness of this green resource and its public welfare, the council's failure to accurately value the trees when selling the estate and to put pressure on the developer and council to incorporate trees into the new development. This campaign emerged from a community workshop hosted by the Elephant Amenity Network and it was led by Richard Reynolds and Guy Mannes-Abbot. The pair formed a Community Interest Company. Throughout summer 2011 the campaign hosted regular guided walks, parties, educational talks and meetings with decision makers on site to recognise the value for all of retaining and enhancing the green legacy from the 1970s. The campaign sought to engage a wider audience than the existing small core of environmentally conscious local residents, by bringing the rational economic and environmental argument for retaining the forest to life be inspiring them with the beauty and playful nature of the place. Facebook, Twitter, community notice boards and media were used to spread the word. The Financial Times and BBC Radio 4 (download) both interviewed Richard for features on the forest. Half the mature trees within the Heygate Estate saved from the saw. A large public space being retained in the centre with new landscaping and branding to make it more welcoming. The developer required to commit to replanting and caring for new trees inside and outside the development as part of their planning requirement. Trees and open space within the new development becoming a focus in the developer's marketing in pursuit of planning approvals and sales. For example the developers branded their estate as “Elephant Park” with districts within it including West Grove and South Gardens. All references to Heygate, a Mayor of London 200 years ago, were dropped. A mayoral RE:LEAF Award in 2013 to campaigners for ‘innovative campaigning on behalf of London’s urban forest’. Development land made available by the council and developer between 2012-17 to this campaign's spin off volunteer venture Mobile Gardeners to use for temporary community gardens. This website is an archive summary. Please visit the social media pages for more information and topical relevant posts. Find out more about further damage to public space at Elephant and Castle by reading Richard's dossier on the #badmadeworse Elephant and Castle Bend, the more deadly, congested and polluted junction built in 2015 at the centre of Elephant and Castle.